The voices were young, but they rang out in a synchronized and forceful chant as the children made their way through the downtown streets. Gloved hands held painted signs as pink and blue bookbags bounced on their backs. “Books, access fairness, we’re marching to raise awareness,” the more than 50 second-graders declared as they marched from the Chinatown gate to City Hall Friday afternoon. “We want justice. We want it now!” they chanted. The youthful protesters were seeking to raise awareness of a campaign to bring a public library to Chinatown, which is the only Boston neighborhood without a library branch. “If you read to your child for an hour every night, by the time your child is 5 years old you will have read 900 hours,” said Lonnie Zapata, a second-grader who was one of the featured speakers. Students and teachers from Young Achievers School held a rally at City Hall for a Chinatown library branch. 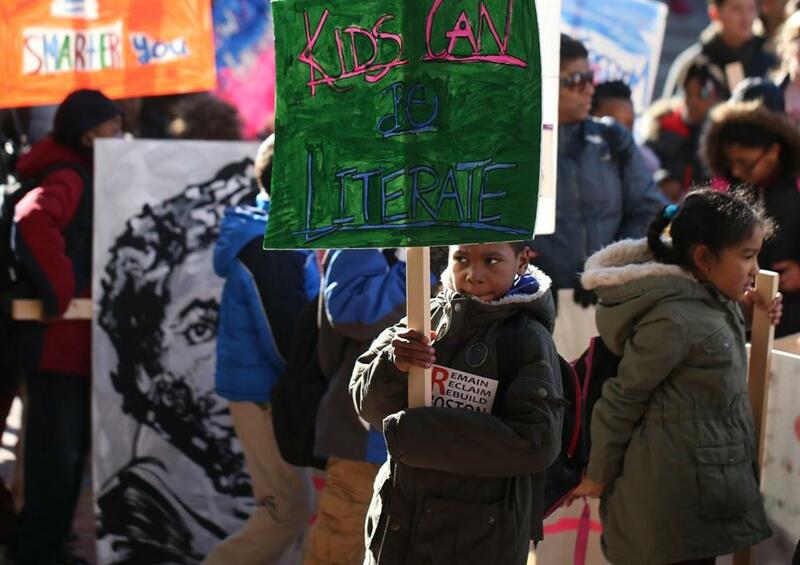 The protest was planned and carried out by students at the Young Achievers School in Mattapan, which as part of its curriculum has recently spent time learning about libraries. Upon hearing that Chinatown does not have a public library, organizers said, the students decided to stage the protest. “They asked: ‘What can we do to help?’ ” said Kim Situ of the Chinese Progressive Association, which helped to organized the march. In addition to the march, the children read poems and speeches, sang songs, and handed out individual pamphlets in which each child had written why he or she believes reading and libraries are important and why Chinatown needs a library branch. Activists in Chinatown have long decried the fact that the community has not had a library since 1956, when its branch was torn down to make way for turnpike construction. “What’s most moving is that these are kids from another community who have recognized an injustice in a neighborhood and want to do something about it,” said Suzanne Lee, a well-known political figure in the neighborhood and the former principal of Chinatown’s Josiah Quincy School. 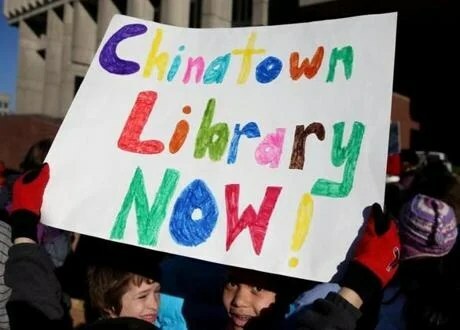 The march was part of a school-sponsored community service project, and several of the young students recited speeches and songs they prepared to advocate for the creation of a Chinatown library branch. The group of 7-year-olds was determined. “I’m getting tired,” said one young girl, carrying a sign shaped like an open book, as the group made its way past Boston Common. “We’re not tired. Come on Isaiah, let’s lead the way,” declared Jonathan, who was one of two carrying a sign depicting abolitionist leader Frederick Douglass near the front of the pack. When they finally reached City Hall, the group was met by a delegation of city officials, including Councilor Michelle Wu, who vowed to deliver the message to Walsh and to facilitate conversations among the council about how to provide Chinatown with library resources.